Part of Bernstein Bash, our season-opening celebration of the Leonard Bernstein Centennial. “In a sense,” Bernstein once said, “all of my music is theater music.” The internationally acclaimed Music from Copland House ensemble explores the always-searching master’s more intimate voice through his finely-wrought, little-known, yet often surprising chamber music. The program features his Piano Trio, Three Meditations from Mass, Variations on an Octatonic Scale, Canon for Aaron, and selected Anniversaries for piano). 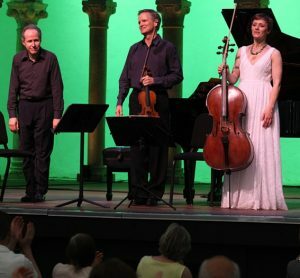 Performers are violinist Curtis Macomber, cellist Alexis Pia Gerlach, and pianist Michael Boriskin.